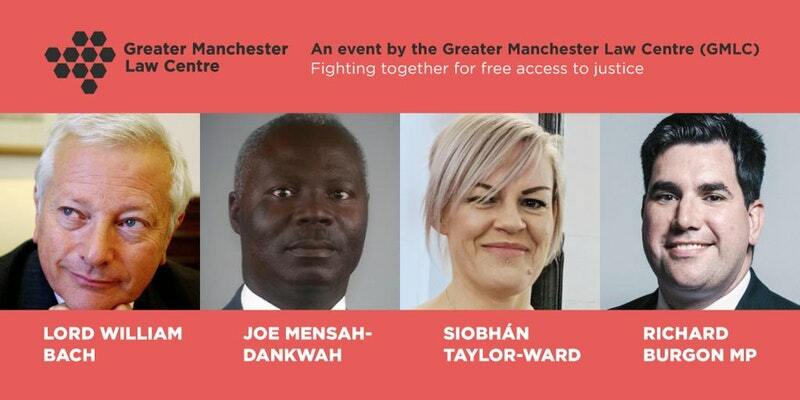 On 20th April, the Greater Manchester Law Centre will be hosting a speaker event on Legal Aid and the future of free access to justice. Our speakers include Lord Bach, Richard Burgon MP, Joe Mensah-Dankwah of Black Solicitors Network and Siobhan Taylor-Ward of Young Legal Aid Lawyers. We would love for you to join us as we discuss the current state of Legal Aid, the impact of political changes, the challenges faced by the next generation of lawyers and our hope for the future. The event will take place at 6-8pm Friday 20th April at the University of Law Lecture Theatre, just overlooking Piccadilly Gardens (Manchester). We encourage booking in advance to avoid disappointment.